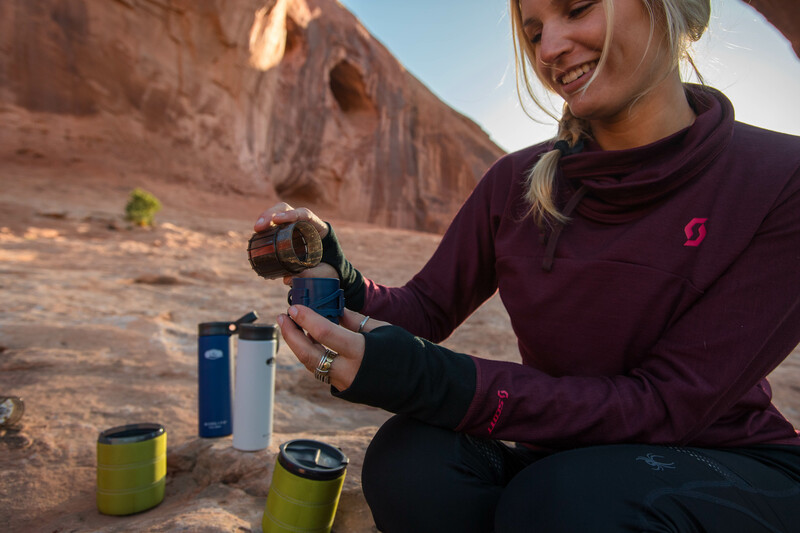 No dawn patrol, sunrise hike, or backpacking trip is complete without coffee. We’ve always prioritized quality coffee brewing products, from percolators to travel french presses to hand grinders. Now a new coffee brewing tool is here to change the way you brew at camp: the Coffee Rocket. This clever, one-person pourover is your new camp morning best friend. This sleek device brews 8oz of hot, delicious coffee in minutes with a no-mess stainless steel filter. Folding legs keep the rocket balanced in place above your cup, and fold away for simple storage. Completely collapsible to fit inside your mug, this 2.7oz paperless filter means you can have gourmet camp coffee without any wasted space. This is the camp coffee maker of your dreams. The Coffee Rocket is easy to use, which is helpful when you haven’t yet had your morning coffee. Start with your beans: use a Javamill to grind up to 10 grams of coffee to medium coarseness. Fill the grounds cup with your fresh grinds and snap the drip cone onto the top of the grounds cup. Unfold the legs, place over your favorite mug, and pour hot water into the cone. Boom! You just rocketed yourself to caffeine town. Lucky for you, the Coffee Rocket is as easy to clean as it is to use. Clean up is a breeze with a detachable funnel and rinsable, reusable filter. The separate grounds cup keeps your coffee grounds locked away until you are ready to clean. Dump the grounds into the trash or compost (or your pack-out trash bag) and rinse out the filter with a little water. Dry and pack away again for another caffeine-fueled adventure. When you need coffee, you don’t need any unnecessary gizmos or complicated brewing techniques - you just need hot, good coffee and you need it fast. Take the Coffee Rocket along on your next trip and you’ll be amazed by its lightweight simplicity.